HOW TO BECOME A HIGH-NET WORTH ENTREPRENEUR. HOW DID HE GET TO BE A GREY CUP WINNER? He envisioned the future he really wanted by seeing his team, the Saskatchewan Roughriders win, feeling the incredible loyalty of their fans, their exuberance in the stands, the fear and dejectedness in his opponents eyes, his coaches training words ringing in his ears and saw exactly when to throw and who to throw the ball to. When did he envision all this success? Not the day of the Grey Cup. Not the day before either. He ‘saw’ that vision in September. And he didn’t just ‘see’ it, he described the moment to his team mates. And to the media. So is Darian a braggart, or a wise strategist? This was a guy who was rejected by the NFL due to his slight stature. Who had to leave the country of his birth if he wanted to keep his dream to play football alive. Who spent years going from team to team building his quarterback skills. Most of us would have given up. Or not wanted to risk having hope for that desired outcome in case we’d be disappointed. Fear of disappointment with the outcome is the biggest killer of dreams there is. And who interprets what any outcome means? Well, we do. So why do we tend to assume that if something doesn’t work out right away it means it never will? Why do some of us hop right into bed with disappointment and kick hope to the curb? We don’t recognize that we choose our reactions to what happens in life. When we choose, we have power to affect the outcome. When we choose to be intentional about what we do want, we stop thinking about what we don’t want (I call that terrorizing yourself with ‘what ifs’). When we think about what we do want, we strategize how to get that, we talk about it, people around us our inspired by the vision and they want to help. Every athlete that’s risen to the top of his or her game does what Darian did. They richly describe what they want to have happen, long before they work hard to get there. There is an invisible line that governs their thinking from today to the moment after they achieve their desired end result. That line of thinking keeps them thinking about how to get there. Thinking strategically and acting tactically is what keeps them on track to get that result. What was Darian aiming for? It wasn’t winning or not winning. That’s the terrorizing game that keeps us in fear of disappointment. He wanted the lever, the catalyst that would make winning inevitable. The practice of being consistent in every game, in every play on and off the field was his critical success factor. Consistency of preparation, play and communication. He found what worked in how he communicated with his team, his coaches, himself. Consistency of practice in all these areas delivers the expected result every single time – winning. Darian’s desire for consistency is what fed his hope. In your business, your life, are you feeding hope or terrorizing yourself with either/or thinking that leads to disappointment? Will you get the return on your investment in your business that you rightly deserve or are you just working the daily routine, content that you have arrived at the peak of your business career? What outcome do you really want? WHERE WILL YOUR REAL WEALTH COME FROM? In our work helping business owners stabilize and grow their companies to the next level, we partner with wealth managers, or private bankers who are like concierges to people with lots of complex financial situations. More than 60% of the people who retain wealth managers are business owners! The rest? Professional sports stars like Darian and professional service people like lawyers. Why is this important to you if you own a business? To open up to the possibility that you could climb into that high net worth category far more easily than most people… if you play your cards right. Well, it starts with investing your salary and dividends effectively. But that’s the small potatoes basics. You know that already. But here’s what you might not know. 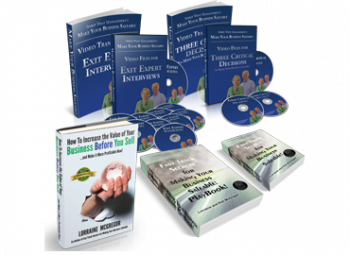 You can get into this class of business owner when you recognize your regular pay check and dividends may not keep you in the lifestyle you have become accustomed to when it comes time to move on from your business. Yes, we all think we’ll keep working to stay active and relevant. But to what end? What do you want in return for continuing to work in your business? Now that’s a powerful question that can open many possibilities, if you let the idea sink in. What will give you many more options for your financial future and your sense of identity and satisfaction is making your business saleable so it can give you a rich reward. You want to stay active which is great. But how? Don’t tie the desire to stay relevant to your company. The right time to sell it is when it’s exactly what a buyer is looking for because you made the right changes that will attract the right buyer willing to give you a premium offer is the way to achieve high net worth status. So after you unhook the idea that staying relevant and selling are not part and parcel, you may have to evolve your thinking and throw out some conventional mindsets. YES, THE WEALTHY DO THINK DIFFERENTLY. SO SHOULD YOU IF YOU OWN A BUSINESS. 90% Failure Rate Forget the idea that you can sell when you want for what you want. Just because you get calls and letters from investment bankers asking if you want to sell does not mean you have a saleable business. It means they want to screen your books for a fee to see if they could find a buyer. Given that current statistics show 90% of companies fail attempting to sell, don’t believe the assertions you hear. Lack of Saleability Companies are failing to sell because they have not been made saleable: meaning that the next owner could not get the same results you get. Your successful business is not transferrable to another owner. Here’s the sequence of questions and new information you need to replace these mindsets. “Ready to learn how to get that new owner? 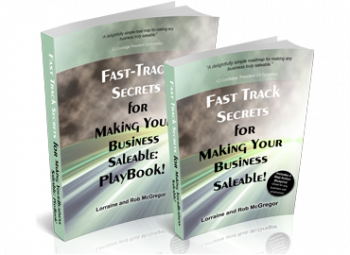 Now that you’ve decided that you want to be able to sell your business and given that 90% of owners are failing at doing just that, you need to learn how to make it saleable so that you will be one of the 10% that find a buyer.” Read “Fast-Track Secrets for Making Your Business Saleable”. 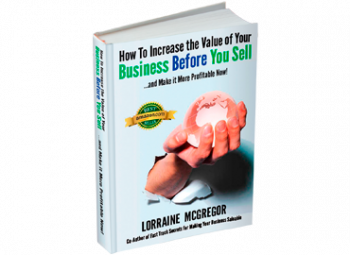 Get the book and the playbook so you can build your blueprint to become saleable and make the right changes. The bottom line? If you don’t want to risk disappointment that the end of your business life comes with few rewards having to deal with circumstances and unintended consequences you had feared, then feed your hope. How do you feed hope? Make your business saleable. That’s what will give you consistency in your profitability and certainty in your future.